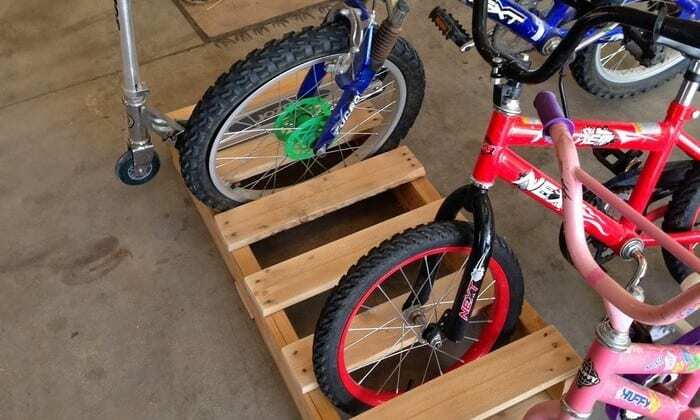 If you don’t have a bike rack or stand for storing and keeping your bikes organized yet, then build one using pallets! This pallet project is very simple and it doesn’t matter if you’ve got big bikes or kiddie bikes (or both). Most pallets will fit any regular bike wheel size. Even kids’ scooters fit perfectly in a pallet bike rack! Your DIY project may need some modifications depending on the pallets that you get and the bikes that you have. Nevertheless, building a pallet bike rack is a quick and easy project you can finish within a couple of hours. Want to learn how the featured DIY pallet bike rack above was made? You can find the link to a step-by-step tutorial below! You can also get more DIY pallet bike rack ideas by viewing our album. Previous PostOrganize your jewelry with a silverware tray! Next PostTurn vintage suitcases into a unique side table! Build a clever floating pull-out crate storage! Make your own pallet breaker tool!